just up the pike: another take on which parts of the DC area are "urban" or "suburban"
another take on which parts of the DC area are "urban" or "suburban"
Last month, I used housing density to map the real boundaries between "urban" and "suburban" in the DC area. But what if you took other factors into consideration? This map looks a little different, but still shows that there's more "city" than what's inside the DC line. How economist Jed Kolko would classify "urban" and "suburban" parts of the region. Map by the author with Kolko's data. My maps are based on research from Jed Kolko, chief economist at Trulia, who mapped several other metropolitan areas around the country. He reached out to me with his own data for the DC area, which is available on his website. While I only looked at housing density as a measure of urbanism, Kolko included several other factors, including the density of jobs and businesses, how many people go to work without a car, and the presence of multi-family housing. Compare Kolko's map to my map below. One big difference is that his analysis only goes to the zip code level, while I used Census tracts. That makes my map is a little finer-grained, focusing on neighborhoods as opposed to larger areas. 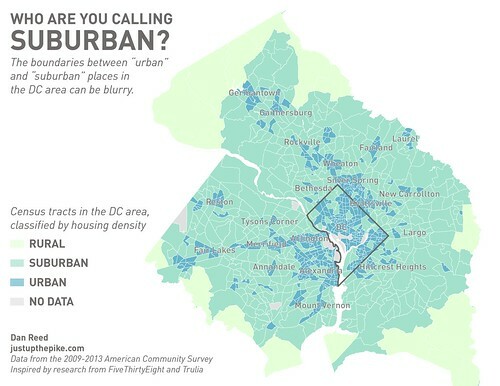 And while he agrees that there are "urban" places well outside the District, Kolko's analysis finds fewer of them, particularly in Northern Virginia. My earlier map, looking solely at housing density. 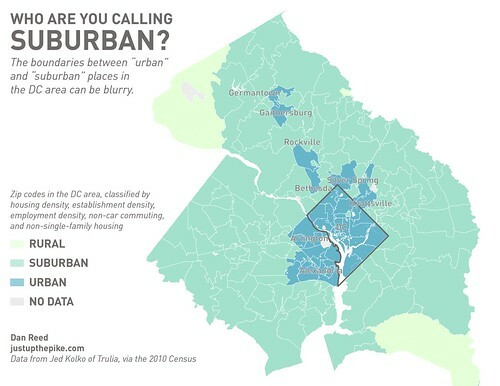 Kolko classifies all of the District, Arlington, and Alexandria as "urban," even areas that are pretty spread-out and arguably suburban in character, like the Palisades in northwest DC. Like me, he also includes several older communities in Maryland that originally developed around streetcar lines and as a result look very similar to urban neighborhoods in DC, like Hyattsville, Silver Spring, and Bethesda. My map also identified many newer communities that are gaining more urban characteristics, like White Flint in Maryland or Tysons Corner in Virginia. Kolko includes several of those places in Maryland, but not a single one in Virginia. In fact, he doesn't consider anything in Fairfax County "urban." I wasn't the only blogger to look at housing density as a measure for urbanism. NextSTL, a St. Louis-area blog, made a similar map and found that "urbanism" can be found on both sides of the city line there too. What do you see in these maps? What factors do you consider make a place "urban" or "suburban"? I walk to Metro in Wheaton from what would otherwise be considered a suburban neighborhood. But given the size of the lots, the proximity to Metro and other factors, I would call it urban easily. We not only have two bus lines running through our neighborhood, but a BRT line is being considered for the major thoroughfare that runs E/W.